VDC Display Systems and Sony Unveil the New VPL-GT100 4K Compact Professional Series Projector. I/ITSEC / ORLANDO, Fla – December 3, 2012 – VDCDS a leader in simulation projection display and visualization solutions, sets new standards in simulation and training at I/ITSEC 2012 with advancements in solid state projection technology, improved versatile workstation (WS72) for versatile training capabilities, and dual-input projection system architecture with output for improved dynamic image quality. VDCDS Will introduce the new Sony VPL-GT100 professional 4K projector â€œCommercial projection and display applications require next-generation technology to create enhanced realism for the ultimate visual and training experience,â€ said Sander Phipps, senior product manager, professional projectors, at Sony Electronics. â€œThis new model builds on Sony's pioneering innovation in 4K projection to deliver a solution that fits an array of professional needs.â€ One of five 4K professional projectors VDCDS currently offers. VDCDS Will also be displaying two newly redesigned WS72’s in two different configurations. WS72-1: Driving/racing simulator equipped with the Logitech G27 dual-motor force feedback. This powerful system is configured with Scalable Desktop solutions running Dirt 3 at 3860 x 1024. 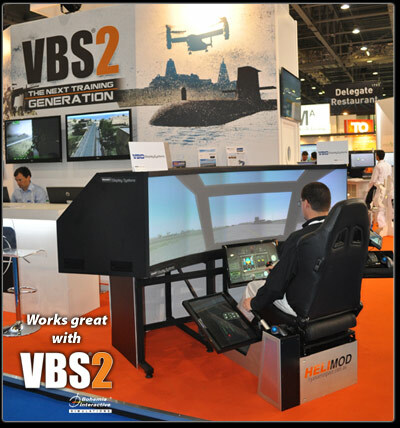 WS72-2: Flight Simulator/Trainer equipped with the Ryan Aerospace Helimod. This HELIMOD will be integrated with an impressive visualization display using five high quality LED projectors and image blending software in one neat unit that provides a fully immersive experience for the pilot / student / user running VBS2.